Both MNA and District Six Alder Marsha Rummel, who is a member of Landmarks, held several public forums and discussions on the issue and recently the MNA Board voted 7-3 to send letter of support for the project to Landmarks. At the meeting today, the Commissioners struggled a bit with how to justify a decision either way. The commission asked some of the public who spoke the meeting if the proposed project was a exceptional design which could possibly mitigate the loss of the current structure. Those who did respond both for and against were not sure, but felt it might have been, certainly not definitive enough to tip the balance toward approval of the demolition. Exceptional designs is one of the ways developers can earn an exception to the planning restrictions that the neighborhood developed early last decade and serve as a guidepost to both Landmarks and the Plan Commission. “Is this an exceptional project?” Willy Street resident Lindsey Lee said during the public comment section of the hearing. “That’s a hard question to answer. I say ‘It is’ given the restrictions we put on architects, especially in historic districts. Rummel noted that all the other parcels on the same block were commercial but did not fill up their entire parcel, which is a trend with new developments in the city, especially infill projects. Commission Chairman Stu Levitan asked Randy Bruce of Knothe-Bruce if they could reduce the footprint to which Bruce responded that it was unlikely. Commissioner Christina Slattery said that her objection to granting demolition is fed by the project’s footprint within the lot, the lack of green space and the architectural “Sameness” she is seeing recently in proposed projects. 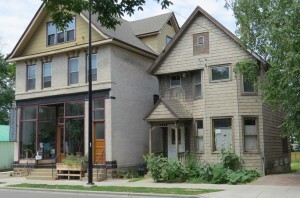 The Commission voted to deny the Certificate of Demolition based on Landmarks Ordinance 33.19(5)(c)3 paragraphs b,c and g; as they felt the current structure contributed to the historic character of the neighborhood and demolishing it ran contrary the purposes of the ordinance which is essentially historic preservation. The vote also said that the proposed structure was not compatible with the surrounding buildings. Recent attention has been given to landlords in this neighborhood, especially after the Tony Robinson shooting when the owner of the property where he was shot was thrust into the spotlight. Ray Peterson owns 1125 Williamson and more than forty other properties around Madison and has been accused of being a slumlord for the conditions of his property and lack of service to his tenants. 1018 Williamson (right) has been sold. Previous owner Mike Kohn who also owns the Petinary (left) wanted to convert the property to greenspace. Mike Kohn, owner of the Petinary, probably is not a slumlord but has been the focus of the neighborhood this past year for 1018 Williamson, a property he owned for 22 years but never rented and made few improvements. Facing orders from City of Madison building inspectors he sought to have the home demolished and leave greenspace in it’s place. However the reason for the demolition request was that the property was too far gone to repair without expending exorbitant sums. The neighborhood balked at the plan, partly because the deterioration of the property was Kohn’s own making. The Landmarks Commission gave Kohn a year to sell the property or find a way to incorporate the property into his building next door. This year the neighborhood helped find a buyer for 1018 Williamson and Kohn is off the hook. However, it is deja vu all over again as 906 Williamson is owned by Mike Kohn and it’s likely he was banking on this project to spare him he cost of improvements to this property as well. 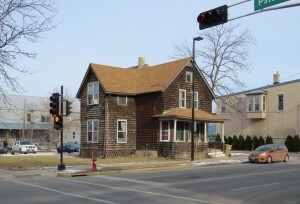 It was noted at the Commission meeting that if the Certificate of Demolition was not approved then the future of the property reverts to the whims of the current owner, Mike Kohn. This entry was posted in Willy Street, Willy Street Commentary and tagged 906 Williamson, Christina Slattery, David McClean, Erica Fox Gehrig, J. Randy Bruce, Jesse Pycha-Holst, John Coleman, Knothe-Bruce Architects, Louis Fortis, Madison Landmarks Commission, Marquette Neighborhood Association, Marsha Rummel, Michaell Rosenblum, Stuart Levitan by TheEastSider. Bookmark the permalink. We need to change the Marquette Neighborhood design standard to allow taller buildings in the neighborhood. The Isthmus is a very special space with limited real estate. We should encourage new development to allow people to live in this special area and make it even more special. Madison is growing; People want to live in Madison; we do not want to sprawl like Detroit has sprawled. This crappy single family home is not consistent with the old neighborhood, where there was room for 3 buildings on the empty space. Do we really want this crappy building and lots of dirt lot surface parking on this corner in 20 years. Is this what we really want Madison to look like in 10-20 years?? I would rather see a new multi-story mixed-use building here. We also need the isthmus to be accessible, affordable, and diverse. That has always been the special part of it for me. I have lived in this area my whole life and am being pushed out because rich white people who work in tech are taking over my neighborhood and pricing out working class people. I am glad they are not demolishing it and turning it into a generic yuppie high rise with ugly architecture that is going to look horrible in 20 years. I kind of balk at liberals who can condemn slumlords but who don’t understand they are pushing out Lower income people, people of color to live in the suburbs. 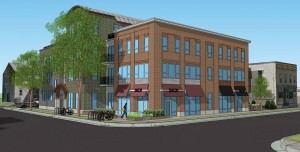 I think that another red brick building is NOT what Madison needs. They are ugly and expensive. They lack art. We have seen along Park Street what to expect. Red brick buildings with no artistic appeal that have such high rent, businesses and renters cannot afford the space. Most all the space in these new buildings are vacant on the first floor. Having said that, I feel Madison needs two things on Williamson Street, one is more parking, the other is to develop an Art District that will be a tourist attraction to bring IN money for the city. Yeah I have to agree with Larry Hands. I guess the historic character of Willy St is dilapidated houses on under used sites while the interior streets become gentrified and long term renters priced out? Seriously, this is supposedly a progressive neighborhood, but homeowners do everything in their power to stop development of new units in a popular neighborhood to raise the value of their house, while hurting the community writ large. And when the author talks about opposition to the project from “the community”, he means opposition from the vocal minority–mostly home owning professionals–that has captured Landmarks and most of the neighborhood associations, to which Landmarks, UDC, and the Plan Commission are too deferential. The community need affordable market rate housing near employment centers (something like 25,000 people work downtown during the day), not nostalgia for Willy of the 70’s. Nobody like substandard housing either, but these slumlords did fill hole in the market. As the city cracks down on them, housing is only going to get more expensive without a dramatic increase in the number of units. Here we had an opportunity to do away with substandard housing while adding housing supply to fill the demand for Willy weirdness. Oh, and the “sameness” of new development people talk about? 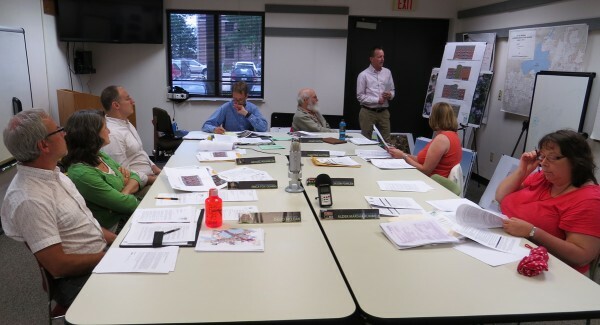 Its not the developers or the architects, its the City staff and these committees foisting their armchair opinion of “good design” tenuously couched in the crappy language of Madison’s overlapping zoning, design, and neighborhood plan districts.